A lot of us in the early Language movement days were interested in getting down to the raw materials. We wanted to see if we could explode them. BA: In the beginning, the early days of Sally's dance work, I wasn't supplying texts for her concerts. She was reading her own poetry texts, at the start of a performance. she started doing this kind of multi-media performance, I got involved doing the music for her. I was her musical director for 25 years. The only place I did the text for her performances early on was for a performance group we started called BARKING. Originally, that group was just the two of us — a theatrical project. Q: Funny title! Where did the name for BARKING come from? SS: I think we just thought it was a good name. It had something to do with what we thought theater was... barking about — mostly political things. BA: So we started and became, actually, a trio, with Tom Cora joining the group. Tom is the great improvisational cellist. He was a central part of the downtown improv scene, which included others like John Zorn. We did our trio performances. Tom did some movement. I did, too. SS: Everybody had to read, to move, to play music. BA: I wrote the text. And Sally did the choreography. SS: And I had them both move! BA: We were dancers — so called. Q: That fascinates me... to think of you dancing, too, Bruce! BA: [to Sally] What was that blender piece? SS: I played the blender and the radio. We did several performances like that in clubs, little galleries, St. Marks Poetry Project. BA: And then we did a couple of mid-sized pieces, ones that involved several people. We performed one at Roulette — we had about 10 people in that piece, including celloist Tom Cora and composer/musician John Zorn — and we performed another piece in San Francisco. SS: ... before it became a curated space. BA: The first one from 1983 was called Eagles Ate my Estrogen, which was our Kabuki-based piece on "gender damage." SS: We decided to layer Kabuki moves and attitudes on and into a piece about feminism and gender. BA: We were going to the Wooster Group — we were pretty close to Richard Foreman (this is still about '83). We added live instructional materials to our performances — people demonstrating how to do Japanese costume stuff or makeup stuff. And we had live documenters doing paintings and drawings on stage. 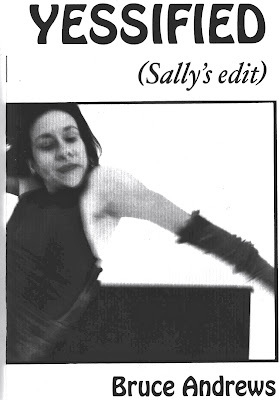 By that time, I had already been putting music together for Sally, and she was the first person to use in free-improvising musicians in her concerts in conjunction with choreographed dance. The next piece was larger and involved several trained actors. I was writing scripts for characters. The topic was the story of William Walker, the mid-19th century American mercenary who conquered Nicaragua and set himself up as a dictator and was finally overthrown. BA: Right. So that was our historical piece on this theme. SS: It was called, Don't Tread on Me While We Tread on You. BA: And for that piece we had a gigantic cast. SS: It was like a big happening, really. Some people were given instructions just at the moment, and they had to work them out on stage. I'd probably just had a concert, so I put that choreography somewhere in the space, as well. I improvised, and I had other improvisers coming in to that scene — we had a play going on, in the performance. BA: It was then that I think Sally stopped presenting any of her texts, in relation to her dances. I wasn't doing any text for her yet. I was just playing music in improvising groups — and helping Sally to write the scores. Q: I had no idea you were doing all this work with music, Bruce! BA: I've been thrilled to have been asked, maybe upon 10 occasions, to perform as a musician. But basically, I was just doing this work in music for Sally. I had enough things going on. I knew I wasn't going to be ambitious in the music world. The reason I was kind of tolerated by our musicians — who were our friends — is because I wasn't competition. I wasn't trying to get gigs or anything. I wasn't going to have a life in the experimental theater or in music. But I think it was in the 1990's when we started to do more with my text in Sally's concerts. I started to integrate some text into some of her choreographed sections. I started to do something on stage that I had been doing at home: this process of live-editing. I would come in with piles of cards, sort of sorted. I started with this strategy in BARKING. And then there were these live-editing situations in which I was working with Sally's improvising movement. Much later, by the late '90's, we started to put some of text into some of her big concerts. By that time I'd had some residencies where I had processed some of my text in studios — so I had some new kind of work, and I could play those tapes. One of the people I worked with in residency was Michael Schumacher, who has since become a dear friend and collaborator. I not only had the chance to do text live but to work with text I had recorded and processed and treated — and then collage that all into the sound score. PHOTO: Sally Silvers (middle), Bruce Andrews (right of Sally), crew and cast members for weekend performance of "Bonobo Milkshake" at Brooklyn's Roulettte: Composer/musician Michael Schumacher (far left); lighting designer Kathy Kaufmann (left of Sally); actor/performer David Greenspan. Photo by Laura Hinton-- taken after the Nov. 29th performance at Roulette across the street in Hank's Bar. Q: I'm sure this is the academic in me, but I'm trying to locate where this kind of performance experiment is / was coming from — its roots. I know you are both investigating the body — the social body — in your work alone and in your movement-text collaborations. I'm thinking that some of this may originate or be inspired by the jazz music you both love — certainly the improv work of performance. BA: Maybe I don't make those kinds of distinctions. I think everything is internalized, so that any kind of social urgency or social claims are all inside us. We don't have to react to specific events or schools of aesthetics. We're all from avant-garde mavens from different fields. And that's the thing, too, about the late '70's. 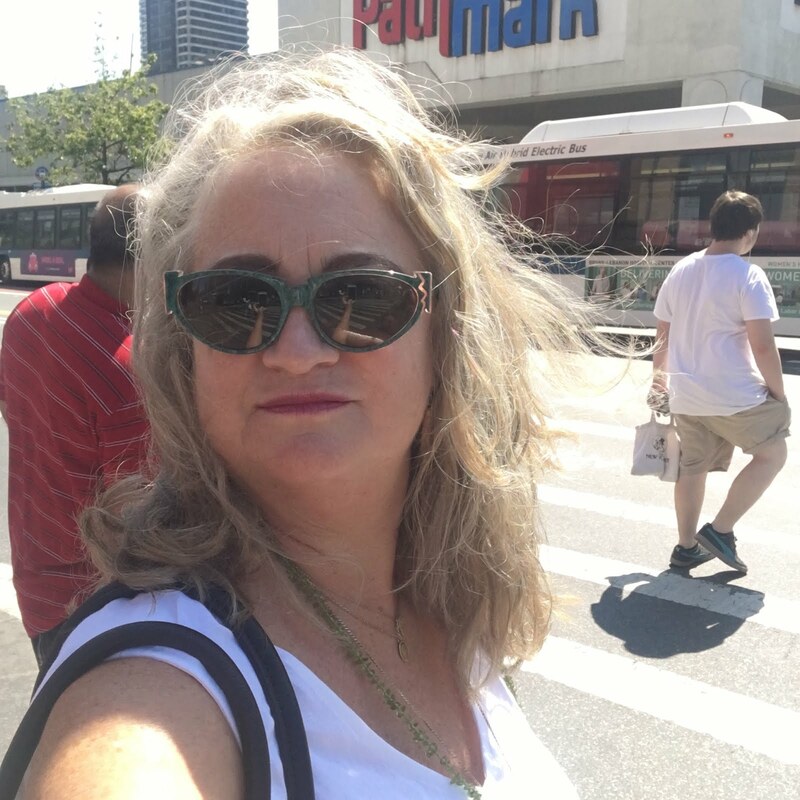 When I met Sally, I was already enmeshed in a couple of communities of people doing stuff that was fairly similar, aesthetically — the downtown experimental film world; and poets, just barely; experimental theater. That gave us lots of impetus to bounce off of other forms of radical disjunction — the post-human, non-autobiographically-centered focus, featuring the use of an exotic, wide-range of materials and also cross-fertilizing media. Q: I'm impressed by your absorption — just being in a scene that was so alive with post-modern art of all sorts — and then taking in that scene and re-using its materials. SS: I think we had hopes that the different media we were involved in would all feed in together and become something bigger. But people in the arts separated out. BA: The problem with New York is that artists are extremely ambitious, and people are operating at the top of their fields. And the fields are so complicated, that these people end up being focused on their own. A small number of people from the film world or the theater world were going to poetry readings, and vice versa. This was an era before everyone was getting information on line. It was hard to keep everything sustained. The poetry scene I was involved with had only about a half dozen people — in New York anyway — a handful of us: Hannah Weiner, Jackson Mac Low, Abby Child, Michael Gottlieb, James Sherry, Alan Davies, Charles [Bernstein], Ray DiPalma — almost all men at the time. There weren't that many people then involved in our aesthetic. Q: What about Anne Waldman, Alice Notley...? BA: Different aesthetics — completely. BA: It's just a different commitment. SS: ... and perhaps different roots. Those poets were coming out of the tradition of the Beats, at least many of them. Or out of the New York School. BA: There's a shelf of books now on why the Language movement was distinctive. Q: I would like to hear Bruce Andrews delineate that distinctiveness. BA: In New York City, we were the modest Left Wing part of the downtown scene. Q: So you circulated with the Poetry Project folks? BA: Yes, we socialized. But the Poetry Project people were a little more neighborhood-ly. I was married at the time, and living on the Upper West Side. I was a college professor in the Bronx. Q: Tell me more about your personal life in that era. I was married when I moved to town in '75, a marriage that ended in '78. I lucked into meeting Sally on the rebound. I had a much more mainstream-looking life, however, than the St. Marks group had. They were much more committed to a lifestyle. But some of the work, like Bernadette Mayer's early stuff, for example, Memory, Studying Hunger, was very influential to those of us writing from the Language aesthetic. SS: And those writers around St. Marks had more of an actual devotion to a lifestyle — that created or helped to mold a different aesthetic. BA: In the mid-'70's, the Language writers called ourselves "Language-centered writers." In other words, we were interested in investigating language, not centered on ideas about self, identity, community, contexts, thematics, etc. Q: One argument I've been reading — I'm a fan of Mayer and Notley, and this idea might hold for their work — is that work playing with the "I" is not necessarily just autobiographical. It's a performance poetry — a performance that stages multiple versions of selves before an also moveable audience. I would also argue that such work also does work with language, although perhaps not in the same way you do, for example, through parataxis and the ruptured fragmented line. BA: Well, I'm not an English professor. So I don't have to study the history of post-war American poetry. We didn't have much dogmatic prescription, and people in town were doing quite drastically different things. But we were lumped together. We had a unity of rejectionism, perhaps — and the so-called Language writers kept our distance from parts of the New American Poetry. We just didn't find it interesting enough to get us juiced up. Q: What is it that gets you juiced up? Is it what's inside words, and that investigation into their inner layers and structural interiors? Or is it more the way in which words can be put together, to construe or construct social meaning? BA: It's both. There's the materiality, which we're completely focused on exploring. And then there's meaning. Which is what we were quite interested in exploring, too. We have been taking on semantics — and that has been partly political. Then there's that social interest in the rhetoric, the bombardment of language coming through the public sphere. We also took some distance from the romanticism of the New American Poets, a romanticism held by the Beats, Olson, the New York School. Q: Yes, there's kind of a neo-Romanticism to a lot of that poetry — I agree. It's also American, that romantic focus on the self — the way that the American psyche is grooved toward the individual. BA: I'm not going to argue that. You can. A lot of us in the early Language movement days were interested in getting down to the raw materials. We wanted to see if we could explode them. And that also has to do with the reader. Q: Bruce, earlier Sally talked about the importance of meeting you in the late '70's -- not just from the perspective of the romantic partnership you would share for so many years but also because of the profound influence your poetic work had on her development as a choreographer-dancer. I'm wondering if meeting Sally influenced your own work as a poet, as well? And if so, how? BA: Influence is always tricky to attribute. But what’s intriguing is a shift I can see in my work in the late 1970s/early ‘80s coinciding with the huge changes in my personal life that put Sally at the center. But this is also a couple years into my college teaching career, into my time as a new arrival to New York City, starting to give public readings & performances, launching L=A=N=G=U=A=G=E magazine with Charles Bernstein, connecting with the energy circuits of a big volatile urban environment & its multi-arts scenes, & within a very different post-Watergate/post-Vietnam political world. But the changes in my writing aren’t unique in the broader national network of so-called ‘Language Poetry’. Tim Woods in the conclusion (“Reading Language Writing”) to his book, The Poetics of the Limit, talks about two ‘phases’ in this project — early on, focusing on single units, more ‘micro’, “the word against the sentence and the syllable against the word” & later, moving toward the exploration of the operations of ideology & ‘social sense’ via larger (more ‘macro’) units of form, grammar & presentational mode. So, it looks to get beyond what Ron Silliman dubbed the experimental poetry prior to so-called Language Poetry (a “non-referential formalism”) but not, even within a political urgency, to fall back on assumptions of transparent representationalism (words directly evoking or pointing to cliché or slogan). This involved a desire to organize the semantic/social ‘afterglow’ of the language materials — as an intervention, making use of some direct (even ‘objectivist’) treatment of language’s prefabricated ‘sense’ yet also with lots of the materialist pleasures of language not subordinated to conventional reference & idiom. That focus — for myself & others, in the very late 1970s & early 1980s — fit amazingly well with an emphasis on performance, site specificity, musicality, & the body. And that’s what became extra alive being with Sally: constantly going to dance & performance events, then with her starting to choreograph (a.k.a. ‘doing her own work’) in 1980 — her first piece tellingly titled Politics of the Body Microscope of Conduct — then in the next few years dancing in her first group piece & in a few ‘politicized’ movement duets, then becoming a musician (doing live mixing of recordings of my instrumental playing, within ensembles of ‘free [non-idiomatic] improvisers’) to get to work with her more directly & eventually becoming the Music Director of Sally Silvers & Dancers while starting ‘Barking’ as a performance project with her in the early ‘80s. All that reinforced this tilt in my writing. The body in performance inherently goes beyond any pure abstraction or non-referential formalism. And — as in Sally’s distinctive work — once it frees itself from devotion to established ‘idiom’, it is ready to explore a social & contextual semantics. This has been a continuing influence on my gathering of raw material, on my editing, on my situating poetry in performance. The show goes on! EVENT FREE & OPEN TO THE PUBLIC.